Our studio relocates to Narberth where we can offer larger, better facilities in a more central position, deep in the heart of Pembrokeshire. Opening day is fast approaching - 1st February from 10:00am to 6:00pm, when you are invited to drop in, have a look arround, and enjoy a free drink and cake. There will be free 20minute Classical Pilates taster sessions, mat work demo's from our Pilates Team, and you can meet the Therapists and practitioners who will also be working in rooms within the Studio complex, where they will offer limited free taster treatments of Reflexology, Massage, Facials and Podiatry. We look forward to meeting you, both existing and potential new clients. Our normal group classes will still continue in Pembroke Town Hall and Cosheston Village Hall at the normal times. Keep yourself mobile during the summer break. We are offering 10 Summer Maintenance classes, all of them booked at Pembroke Town Hall, to carry you through the summer until normal weekly classes resume. These classes will be suitable for all our client levels, so just choose the dates and times most convenient for you. You can come to as many or as little of these as you like - Space permitting - The enrollment to these classes will be on a first come, first served basis, and your places will be secured by payment in advance. Classes booked must be paid for in advance, and no refunds possible without advance notification of cancellation, to give clients on reserve list the opportunity to use the vacated slot. Cash only for these classes please, due to increased processing needed for these individual classes. Please do not pay online or by cheque for these Summer Maintenance Classes. The new term will then start back on Monday 2nd September - All dates and times to be published soon. Hope you all have a great summer & manage to see some sunshine! Rebecca has been away on two weekend courses recently to increase her knowledge of the Classical Pilates Method, with the intention of sharing this knowledge with you and to keep our classes fresh and interesting for you. Niedra Gabriel - Who trained with Romana Kryzanowska, protege of Joseph Pilates. Both Tim & Rebecca attended the sessions with Niedra. Dorothee Vanderwalle - Widely recognised as one of the leading teacher trainers in the world. Although softly spoken, she is a tough task master, teaching challenging sessions, but also keeping them fun. She studied with Romana Kryzanowska, and became her assistant teacher. She is now owner and Master Trainer of Metropolitan Pilates Seattle. Kathryn Ross-Nash - Certified by Romana in 1998. She has worked with four Master Instructors who trained with Joseph Pilates directly. In the Pilates industry, she is recognised as one of the best instructors and practitioners there is. Peter Fiasca - Founder of Classical Pilates - Certified by Romana, and trained with 1st Generation Master Teachers, Jay Grimes and Kathy Grant. He is devoted to preserving the traditional technique and spirit of the original Pilates Method. We are sure you will agree, we are trying to stay true to the Classical Pilates Method and feel very privalidged to have been able to train with the Master Instructors above. Here we go moving toward the end of this term with Christmas to look forward to. We wish you all a lovely Christmas and a Happy & Healthy New Year! This term has been very well subscribed by both our regular Pilates devotees and new starters who are on the steep learning curve we all have to go through when we start discovering our bodies core strength (and weaknesses). Don't forget - Pilates does not stop when you leave the class! Every move should be controlled from your Centre / Your Core, so for example, when you pick up the kettle, start with engaging your core, this supports your spine and gives a good foundation for your arm to perform the lift. It is protection from injury, and should be applied to all movements. It takes a lot of concentration to start with, but your body will eventually learn that "This is the correct way of moving", and it will become automatic, being managed from your subconcious mind. Unfortunately the time has come to adjust our pricing structure for next year; We have not done this for two years, while our expences have increased, so we have to increase our prices, as follows and will apply from 1st January 2012. We will still offer 1 free class per term to those attending more than one class per week. Studio 1 hour session - £30. If you would like us to order you any of the following equipment, for your use at home, please email us your requirements. As most of you will know, Rebecca and Tim ran the Cardiff Half Marathon in October and many of you were fantastically generous in your donations for Donna, who has been fighting long and hard against Cancer. 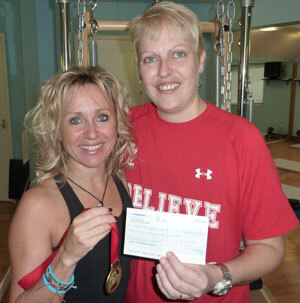 We have finally finished collecting the pledged monies in and were delighted to present Donna with a cheque for £1000. She was overcome with your generosity and sends her heartfelt thanks to all of you. She is planning to use the money to help set herself up with photography equipment for a venture into her own photography business. For those who have not seen our training videos - The first three, covering The 100's, The Roll Up and The Single Leg Circle can be found by following the link below. Link to the PembrokeshirePilates Channel on YouTube for our Videos. We hope you enjoy the newsletter and videos. We value your custom and company. Thanks once again for all the support and help over the last term. We hope you are all feeling the benefits of the classes and are enjoying the variety of moves we teach you. We have again been impressed by your advances this term - Cast your minds back to when you started - How did it feel then compared to now? The next term is slightly complicated and a short one – Only four weeks long except for the Monday classes, which are only three weeks long due to the Bank Holiday Monday 2nd May, when our venues are closed. Also , due to the Mayor Making Ceremony, we are unable to use Pembroke Town Hall on Friday 6th May, so our Friday morning Classes will be held on that one day at Cosheston Village Hall at the normal time. If you have a problem getting there, please let us know and we will try to arrange a lift for you. Have a great Easter break - Looking forward to next term. The new website went live! Hoping it will reduce some of the workload from the over worked Pilates crew! Feed back so far is favourable, and as with all websites it will now grow organically with us. The same day, Pembrokeshire Pilates was delighted to give a presentation to the Hundleton WI, in Hundleton Village Hall - Just up the road! After a brief history lesson from Rebecca, we had twelve brave volunteers down on the mats, sampling the pleasure of Pilates, and judging by the beaming smiles, they all seemed to enjoy it - Well done Ladies! Tim qualified to teach Mat Work after 14months hard study, and is often to be found helping in the classes with correcting postures during the moves - We have noticed our clients trying that little bit harder due this second instructor presence - Keep it up! The new website is "Almost there" - Having it's final nips and tucks. When it goes live, we will send you all a newsletter by email (if we have your correct email address) and will be asking that you Register on line and fill in the health questionaire, which will then be an annual renewal as per good practices. We know you are all waiting for the DVD we keep promising, and as soon as we can get the new website up and running, we will then be putting our attentions towards it's creation. Pembrokeshire Pilates recently supported the army by teaching a class of 55 Riflemen at Castlemartin Camp, helped by Georgina, Lucy, Brenta, Marcia and Anne - Thanks to all of you - It was a total success with great feedback from the troops, who had only recently returned from Afghanistan. Winter Weather Update - All Classes will be running as normal if conditions allow. If not we will make every effort to contact you by phone before the cancelled class. Classes we cancel will be deducted from the full term price. NB. Pembroke Town Hall car park may still be closed due to thick ice. The new November term starts Monday 2nd November and runs till Friday 11th December - A 6week term this time. Rebecca will be armed with more "Dollops" of inspiration for you again, as once again she is in London training with Amanda Brooks (See below). Tim has started his training in London and will be qualified to instruct by Jan / Feb 2010. Looking forward to seeing you all on the run up to the festive season. Rebecca has not been resting on her laurels – She has been very privileged to have done two trips up to London to train with Elite Pilates Instructors; Alvin Quek of the Pilates Clinic, Chalk Farm, including training with Amanda Brooks, who was taught by sisters Amy Taylor Alpers and Rachel Taylor Segal, who themselves were certified by Romana Kryzanowska who was one of Joe Pilates first students and is still teaching today in her 80’s! The sisters own the famous Pilates Center in Boulder , Colorado and it is known to be the world’s foremost and rigorous teacher training school for Pilate’s instructors, keeping to the original and traditional Pilates method. We are sure you will enjoy the benefits – Don’t forget, Pilates is Intelligent conditioning using Mind and Body. A big thankyou to all who generously sponsored us for the British Heart Foundation bike ride - £835 raised for this good cause. It was a lovely ride arround a beautiful part of Wales, and we would recommend it to any one who can balance on a bike for a few hours - As they said at the start "This is not a race!" We certainly proved them right with a "Blistering" time of 4hours to cover 29miles. The present term finishes tomoorrow, but there is still room on some of the Summer Maintenance Classes - Get your name in quick! The September Term starts 7th September as per our "Details Page". Hot news! Tim has been accepted to train as a Level 3 Pilates Matt Work Instructor, starting in October 2009 in London, which will free Rebecca up for more training and provide sickness cover. This will ensure Pembrokeshire Pilates keeps up to date and continues to bring new moves to the classes, and lessens the chances of cancelled classes. Rebecca, Tim and Daughter Robyn and friends Brenta, John & Johnathon, have committed to the British Heart Foundation Sponsored Ride arround the Gower - 29 miles. The Gower Bike Ride takes place on Sunday 5th July, starting at 9.00am from the Recreation Ground in Swansea. We would be grateful if you would click on the link below and sponsor us for this very good cause. Pembrokeshire Pilates has started the sponsorship with a £100 donation - Rebecca's Father was saved with heart surgery, and this is our way of saying thanks. The last week of this term - Hope you have all enjoyed it, and are enjoying the benefits that Pilates can bring when done with good form. I wonder how many of you are feeling improvements? Please let us know through the "Testimonials" page. We can see you are performing the moves with more ease - Don't let it just get easier, try for better form and you will progress to your next level - Straighten those legs / Point those toes / Lift your shoulders and head / Listen well to the instruction and apply your breathing correctly. Good form is Every thing! Ladies (Sorry men), why not try the new Fit Flops from "Sweaty Betty" with which you give your legs a work out while you walk - And look cool into the bargain - Free postage for limited time. What about some new Pilates clothing for the summer? Check out our updated links page where we have placed some links to what we think are great sites to find what you fancy. Well thats all for now - Keep up the good work and see you all next term - Starts 1st June - Details on "Details" page. Well done to all of you this term! You will have noticed that some of the classes have included more traditional matwork at a more rythmic pace and less breaks. This is achievable when the moves are learned correctly and full concentration and strength can be applied. Please note that all of the exercises can still be adapted to suit the individuals needs. The new term will begin Monday 23rd February and run for 6 weeks. We are very pleased with the reactions of our studio customers, and to further improve the experience, we have just completed improving the parking facilities, so there is no excuse now - You must park on the drive! Please also drive at slow speed in Guilderoy Rd. and Cricket Grove as there are small children about. The two Tuesday evening classes at Pembroke Town Hall will be merged to a new time slot of 5.50pm to 6.30pm which makes way for a brand new "Absolute Beginners" class from 6.30pm to 7.30pm, starting 6th Jan 2009. These students will not need to attend a one to one at the studio as all will be "revealed" at the classes. Health Questionaires will still be required. We are very pleased to say that we have finally relocated the home studio to our home in Hundleton, after many early mornings and late nights. We are delighted with the transformation created for us by AA Construction, and feel very lucky indeed. We hope you will have the chance to visit and enjoy the increased head room, floor space and reception, and to try some of the Pilates equipment that is not available anywhere else in West Wales. We have vacated South Pembs Golf Club. Many thanks to the Golf Club for allowing our extended occupancy! As is the way with most building work, the Studio upgrade is taking a while longer than anticipated, but we are sure it will be worth the wait and all the hard work that has gone into it. This is the second time we have used Andrew Cole and his company, AA Construction, and are once again enjoying his work and his company - But it's time to go now Andrew!! We now think work should be complete in next two weeks. Our Studio in Hundleton is going to be improved. The ceiling has always been a little bit low, so that will be raised and velux windows installed, to give more room for stretching and a lighter more spacious feeling to enhance the customer experience. We will also be adding a new reception facility which we hope you will like and find usefull. This will also increase the floor area in the studio devoted to pilates machines and matwork floor exercise. While improvement works are underway, from 26th April to 18th July the studio will be relocated to South Pembrokeshire Golf Club - Please see our Directions page. Took delivery of brand new Half Trapeze Reformer. We are now the only studio in West Wales with this fantastic piece of equipment. Originally designed by Joseph Pilates, and improved by Peak Pilates to become this state of the art piece of equipment, shipped in from America for us. "Pilates for the More Mature"
"Intelligent application of gentle Pilates moves, aimed at keeping you mobile and strong well into retirement". Coffee afterwards always an option - Make new friends too! Booking and payment in advance essential to secure your place. Phone for details 01646 686108 or 0797 1166673. Pembrokeshire Coast National Park staff enjoyed a "Back Care Day", where Rebecca and Andrea showed over 90 employees, in groups of 12, how to take good care of their backs in day to day activities. The day was well received by all and this kind of service to industry could soon become a part of Pembrokeshire Pilates - A win win solution for both employers and employees. The West Wales Regional Topper Racing Squad, were taught about the benefits of "warm up" stretching before sailing, and how good core strength can help give the sailor the competitive "edge" in racing. Special thanks to Richard Twining - Regional Development Officer, pictured below with Rebecca and the sailing squad. 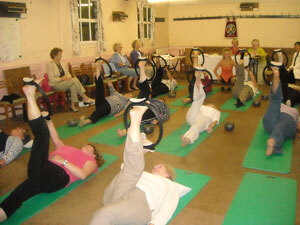 Rebecca has recently completed teaching Pilates to the Girl Guides of Pembroke Dock. This comprised twelve weeks of one hour mat work sessions, and went towards the girls Duke of Edinburgh's Bronze Awards. The Guides worked very hard to achieve their certificates and Pembrokesire Pilates recognised this when completing the Bronze Award reports. Geraldine Butland the Guide leader should also be recognised for all her hard work and commitment.